Most of my more or less distant ancestors that emigrated went to the US. I have spent quite some time digging into on-line American genealogy resources so I find when its says America in the Moving to-column in the Swedish church books rather exciting. Also, some of them went to Denmark. Not too bad but I haven’t really had the time to dig that much in the Danish archives. But when it says Germany I feel it might just as well said “the moon” and I quickly turn around and away from that brick wall. That is way I rolled my eyes when my 26-year old Carolina Blomgren with her six-month baby-girl born out of wedlock Anna Mathilda went to Brandenburg, Germany in 1880. That was the last thing I would see about them I thought. But then suddenly, weeks later, the leaves began to shake at ancestry.com, record hint about Anna Mathilda. And it was a match. Anna Mathilda Blomgren, born in Karlskrona, Sweden, November 16 in 1879 on October 22 in 1904 married Ferdinand Friedrich Christian Krüger in Prenzlau, Brandenburg, Germany. The record also states she is the daughter of Karolina Hangohr, born Blomgren. Suddenly I find some more matching records. Ferdinand dies in December 1916 and Anna Mathilda married Johan August Max Lasser on May 2 in 1919. I notice that in some records Blomgren is spelled Blumgrenn and that generates even more records. Carolina had a son, Wilhelm Ernst Hangohr in 1884. 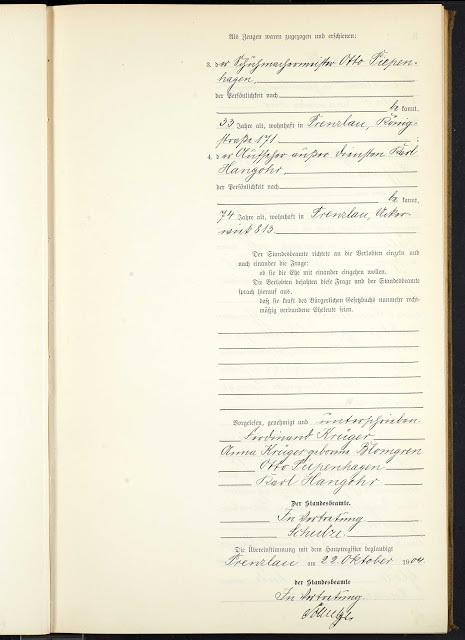 And he got married in Berlin 1909 to Johanna Ernestine. 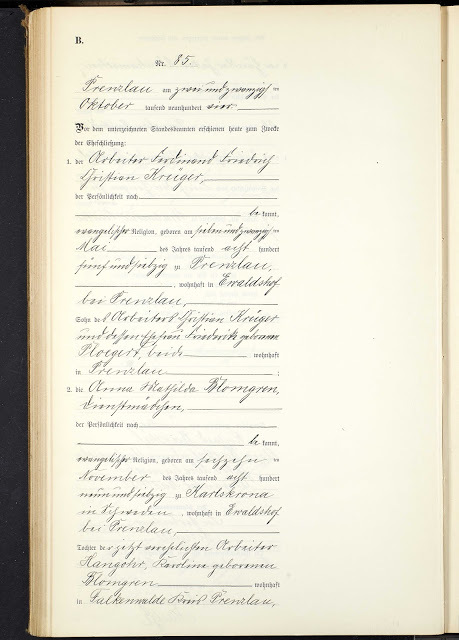 Thanks to that first marriage record, my German immigrants doesn’t feel like such a big brick wall anymore.